I am one week into Pantry Challenge 2017. One week down and we are looking good (said everyone at the end of the first week!). The First week is always the easiest, isn’t it? Here’s a recap of how the first week went down in the ARM house. We ate very well last week, although I went astray one night and purchased dinner at the drive-thru (life happens). One night a week The Girl has a class 30 minutes away, and we don’t return until 6:00ish. In the future, this needs to be a leftover or slow cooker night to avoid the drive-thru trap. Monday – Spaghetti & Meatballs, green salad, corn, garlic bread. Tuesday – Breakfast for Dinner (pancakes and sausage). Thursday – Tilapia 2 ways (Cajun pan-fried with homemade tartar sauce and lemon pepper baked in foil packets), baked french fries, salad. Friday – Make Your Own Pizza on Naan bread, homemade pizza sauce, green salad. Saturday – Veggie Beef Skillet, garlic bread, orange slices. Sunday – Chicken Spaghetti, fruit salad, green beans. Breakfasts – Breakfast sandwiches (egg, sausage and cheese on English muffin), bagels with cream cheese. Lunches – Baguette sandwiches, leftovers, homemade Lunchables. Snacks – Retro Spinach Dip with Hawaiian bread bowl, Cuties, apples. What did your menu look like last week? Any challenges you had to deal with? I spent $36 at the grocery store this weekend, a little more than the $30 I budgeted. Despite going over budget, I’m going to count it as a win as $36 is considerably less than what I spent per week in December. The bulk of this shopping trip consisted of fruits, veggies, bread and milk. A couple packages of deli turkey and ham landed in the cart, too. Paired with “fancy bread” the deli meat is used for Teen lunches. I’ve found that a homemade sandwich on a baguette, complete with lettuce and tomato, is much more enticing to The Teens than a sandwich on plain old sandwich bread. My lack of planning and organization in December resulted in my purchasing waaaay too many specialty foods for the holidays (cheese, Chex cereal & smoked salmon I’m talking to you). I still have ingredients to make many special snacks and appetizers that we generally only eat around the holidays. Retro Spinach Dip is a perfect example – who the heck makes Spinach Dip as an everyday snack? Now that I know what I have on hand, some of these foods will be repurposed for our Super Bowl party or Valentine’s Day meals. The remaining ingredients will find their way into our weekly lineup. On the plus side, my spending for Super Bowl and Valentine’s Day meals should be lower as I won’t have to purchase as many special goodies for these special meals. This was a “no gripe” week from The Teens – amazing! I’m certain this will change as the Pantry Challenge progresses. Despite eating almost all of our meals at home this week, the freezers, frig and pantry still look stuffed. It looks as though we’ve barely made any progress – bummer. Hoping this coming week will reveal more “open space”. Who knew it would be so difficult to take a photo of daily meals??? Most nights I didn’t remember until after the kitchen was cleaned up. I’ll try to do better posting photos on my Instagram and Facebook pages this week. 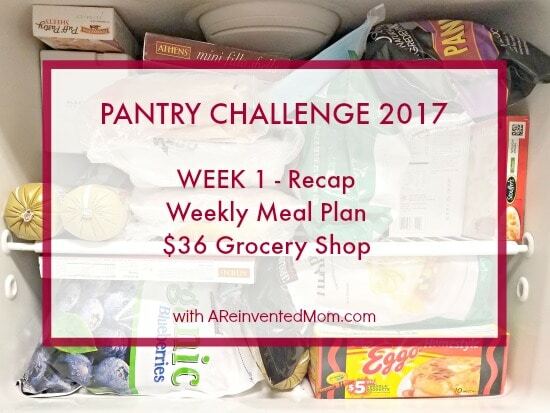 I’d love to hear how you are doing with the Pantry Challenge 2017. Feel free to share your wins and challenges in the Comments or post to my Facebook page. Sometimes I do the July Challenge as well – depends on how full the pantry is. I’m hoping to keep myself in check when this one ends. Good luck on this journey! It’s an adventure for sure. YAY for a no-complain week from teens – that’s an accomplishment!!! !